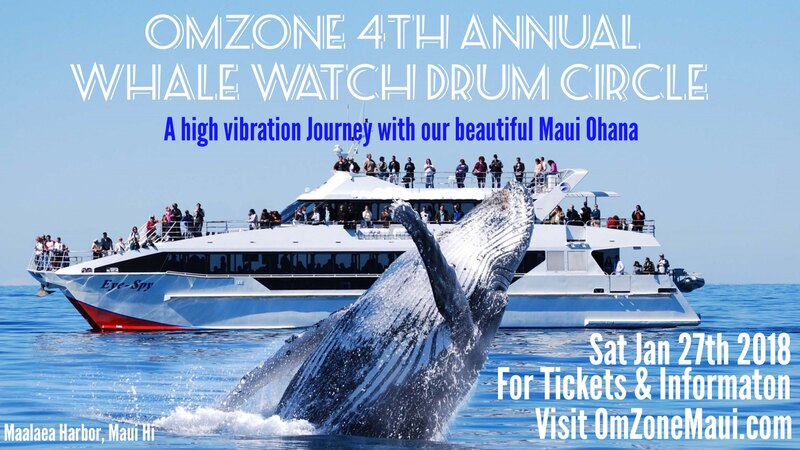 OmZone 4th Annual Whale/Drum Excursion! OmZone Maui’s 4th Annual Whale Watch Drumming Excursion! This OmZone High Vibration Journey has African Drumming, Dancing, Our Beautiful Maui Ohana, Libations, A Spectacular Sunset and of course the Graceful Whales. Join Adisa Omar for a Jammin Good Time Cruise on board “The Brand New Calypso 55′ catamaran” Bring Drums, Shakers & Your Dancing Spirit or You Can Dance To Ours! VIP $55 / Adults $40 / Seniors $35 / Keiki $30 (12-7) / 6 & Under Free (1 per pd adult) VIP INCLUDES = Early Entry for First Choice Seating, Champagne Welcome & Pupu’s!